Results of a recent tiger population estimation exercise in India released today show that the numbers of the highly endangered big cat have increased in the country. New Delhi - Results of the recent tiger population estimation exercise released today show that the numbers of the highly endangered big cat in India have increased in the country. The estimated population of 1,706 individual tigers represents a 20 percent increase from the last survey in 2006, which estimated a number of 1,411. The increase is based on the survey of additional areas as well as an increase in the number of tigers within high-density populations. These results are the highlights of the Indian Government’s report - Status of Tigers, co predators and prey in India, 2010, which was released by Sri Jagdish Kishwan, Additional Director General (Wildlife), Ministry of Environment and Forest, Government of India at an event organized by the National Tiger Conservation Authority (NTCA) at WWF-India in New Delhi earlier today. This countrywide assessment of tigers, co-predators and prey included all 17 tiger states, and involved 477,000 work-days by forest staff and 37,000 work-days by professional biologists, making it the largest exercise of its kind in the world. 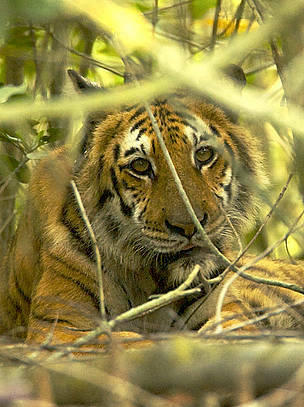 Despite the good news, the detailed report warns that tigers are still in danger due to an overall 12.6 percent decrease in area occupied by tigers, meaning more tigers are being squeezed into smaller areas, which could lead to a lack of dispersal and consequent loss of genetic exchange between populations, and an increase in human-tiger conflict. WWF-India partnered with the NTCA and the Wildlife Institute of India, which led the massive estimation exercise. WWF played a role in the exercise across the landscapes where it works in the states of Arunachal Pradesh, Assam, Kerala, Madhya Pradesh, Tamil Nadu, Uttarakhand and Uttar Pradesh, covering both tiger reserves as well as habitats outside tiger reserves and connecting corridors. The report further states that tigers require good forests and prey, along with undisturbed breeding areas, for long-term term survival. It is hoped that the recommendations in the report will lead to planning decisions that balance India’s long-term development needs with conservation concerns to secure a future for the country’s most iconic species. A female Bengal tiger (Panthera tigris tigris) resting in the undergrowth of a mangrove forest in the Southeast Sundarbans, Khulna Province, Bangladesh.